The IRS said on January 31, that it has discovered during testing that it can’t accurately process Form 8863 for Education Credits without further tweak its computers. So, it won’t process returns claiming the American Opportunity Tax Credit and the Lifetime Learning Credit until mid-February. 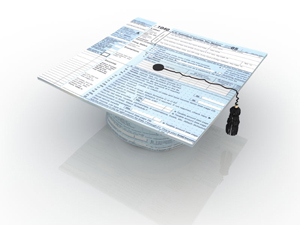 For the American opportunity tax credit, an eligible student is a student who: (1) is enrolled in a program leading toward a degree, certificate or other recognized post-secondary educational credential; (2) has not completed the first four years of post-secondary education as of the beginning of the taxable year; (3) for at least one academic period is carrying at least ½ of the normal full-time work load for the course of study the student is pursuing; and (4) has not been convicted of a felony drug offense. To be creditable, the expenses paid during a taxable year must relate to: (1) an academic period that begins in the same taxable year; or (2) an academic period that begins in the first three months of the following taxable year. It is a tax credit for the cost of tuition, fees and course materials paid during the taxable year. You may be able to deduct qualified education expenses paid during the year for yourself, your spouse or your dependent with the Tuition & Fees Deduction. You cannot claim this deduction if your filing status is married filing separately or if another person can claim an exemption for you as a dependent on his or her tax return. The qualified expenses must be for higher education. The tuition and fees deduction can reduce the amount of your income subject to tax by up to $4,000. This deduction, is taken as an adjustment to income. This means you can claim this deduction even if you do not itemize deductions. This deduction may be beneficial to you if, for example, you cannot take the lifetime learning credit because your income is too high.